We begin our story with a retired farmer in his mid-80s living in the rural Victorian countryside. He had suffered from a rather spectacularly unique series of physical problems for decades, and had thus made a special trip to Melbourne so as to seek the opinion of our neurophysiology department regarding his situation. The unfortunate fellow had been reviewed by several different neurologists over the years, and now it was our turn. Upon being placed into the comforts of his new ward bed, I was called to come and review him. As I was hoisting my tendon hammer and heading out the door after completing my latest nerve conduction study, one of our two senior neurophysiologists stated, "tell me the diagnosis on that farmer so that I don't have to come up with it myself". The gauntlet was thrown down, and I was resolved to make the diagnosis, whatever that was. I entered the room, introduced myself, and met our farmer and his wife. A quick glance revealed a tall, thin elderly gentleman of European ancestry with some obvious clinical abnormalities, which I shall mention later on. I noted that our man was tired, as though he was in the midst of a journey with no end in sight. We went through his story. Our enduring farmer took me back to the early 1970s, when he was only in his early 40s and working in one of Victoria's sheep farms. He was a hired hand, and the hardest work involved shearing all of those sheep; the work took its toll. Some days, after shearing, he noted a slight lack of control in his fingers. He kept dropping things, especially coins whenever he tried to retrieve them from his pockets. Over two or three years, this progressed slowly until it was happening even on days that did not involve sheep-shearing. By mid-1970s, another thing happened - he progressively experienced a loss of balance over several weeks, tripping over his own feet. To add to the balance difficulties, our farmer also recalled an episode of weakness in both legs that occurred over several days, actually leaving him in a wheelchair for a few weeks. He saw a couple of local doctors, who were somewhat perplexed, but after a period of angst his leg strength returned and he resumed walking again. He was still not quite back to full strength though - the fingers were still a bit clumsy, some balance difficulties persisted, and he still felt a little bit of constant weakness in the legs - so our farmer quit his work at the farm, and busied himself with a variety of less physically stressful jobs over the ensuing years. Our farmer continued to experience mild clumsiness and weakness but avoided the wheelchair during those years until an emotionally traumatic event occurred in the mid-1980s. His first wife passed away. Our farmer was lost and distraught, and to add to his distress, it was at this point in time that a few more adverse events occurred. The fingers and walking deteriorated again such that he now had difficulty using his fingers to get dressed, or walk without falling over. He felt the leg weakness increasing as well. Moreover, some new troubles arose. First, he noticed some mild burning pain in his feet that rose upwards over the course of several days, eventually forming a band around his waist. It felt like a "sunburn". Second, he was becoming short of breath even with minimal exertion. This time, our farmer was taken to the local hospital. The doctors there noted the history of his condition, and performed an examination. They made several key observations. Our farmer had reduced power - mildly so in the distal upper limbs (mainly the hands), and moderately so in the proximal and distal lower limbs. He was areflexic (no tendon reflexes) in all limbs. On checking his sensation, there was a disconnect - our farmer could detect pain and temperature normally, but he displayed markedly reduced vibration and proprioception (the sense of position of a joint in space). His gait was ataxic (poor balance combined with a wide-based stance usually - but not always - resulting from damage to the cerebellum) and he had a positive Romberg's sign (standing with his eyes closed resulting in falling over to the side - though hopefully he was caught before hitting the floor when this was tested). A positive Romberg's sign points to a particular kind of ataxia - a sensory ataxia (ataxia resulting not from a cerebellar problem, but from loss of proprioceptive sensory input). Many tests were ordered, but perhaps most importantly, the doctors asked a local neurologist to perform a nerve conduction study on our farmer. A nerve conduction study is a diagnostic test used to evaluate the electrical conducting abilities of motor and sensory nerves within the body. The electrical signals relayed by nerves are recorded as waves. If a nerve is damaged, any electrical signal that passes down it will show a measurable reduction in one or more of the wave latency (when a nerve is stimulated, this is the time it takes for the wave to appear at a distant point along the nerve or the muscle that it innervates), amplitude, and conduction velocity. Virtually any nerve can be tested. The beauty of a nerve conduction study is that it assesses nerve function as opposed to most of the tests in medicine, such as scans, that assess structure. This is important, as a structural abnormality does not always translate into a loss of function. The problem with nerve conduction studies is that it is difficult to do them well - a host of technical issues can distort the conclusions, so the person performing the study must be a bit fanatic about obtaining good results. Returning to our farmer, the results of the nerve conduction study suggested a mixed demyelinating and axonal neuropathy (demyelinating neuropathies involve damage to the myelin insulating sheath surrounds most nerves, allowing them to send signals more efficiently, whereas axonal neuropathies involve damage and degeneration of the nerves themselves). His nerves were, in a word, struggling. He was promptly diagnosed with a chronic inflammatory demyelinating polyneuropathy (a disorder in which immune cells attack the myelin of the peripheral nerves, resulting in any combination of weakness, numbness, tingling, pain, and difficulty walking, not to mention areflexia) and commenced on high doses of prednisolone (a steroid that reduces inflammation). Over several weeks, he improved enough to return home. Our farmer was doing well in his recall. We were now into the 1990s, during which time the local neurologist had attempted to treat our farmer's presumed chronic inflammatory demyelinating neuropathy with alternative immunosuppressive medications so as to reduce the steroids (in the long-term, the side effects of steroids can be brutal, resulting in high blood pressure, insulin resistance, changes in appearance, and reductions in bone density, to name but a few). The neurologist tried azathioprine (a purine analogue that blocks DNA synthesis, thus hindering the proliferation of rapidly dividing immune cells) and cyclosporine (a calcineurin inhibitor that lowers T cell activity) for several years. Neither of these helped. In the late 1990s, he tried something different - intravenous immunoglobulin (created from the pooled antibodies of blood donors, it is not clear how this works but it somehow reduces the levels of potentially harmful antibodies). Promisingly, the intravenous immunoglobulin improved our farmer considerably. As he marched into the 2000s, our farmer's condition continued to slowly and insidiously deteriorate depite the intravenous immunoglobulin. The clumsiness in his hands became worse, and he needed a frame to assist with walking most of the time. The "sunburn" band sensation moved up to his chest. As if this was not enough, further problems developed - during times when he had a cold or experienced a particularly emotionally stressful event, he would develop bilateral eyelid weakness, tingling around the lips and mouth, and slurred speech. These episodes persisted for about a week, and always fully resoved, but they began to increase in frequency as the years went on. More troubles were to follow. The balance and weakness in our enduring farmer declined even more, and he he became reliant upon a frame at all times - fortunately he had remarried some years back and his second wife was helping to care for him - and what was more, he developed restricted eye movements in all directions. He simply could not move his eyes. These additional problems in the face and eyes were not a feature of his presumed diagnosis of chronic inflammatory demyelinating polyneuropathy - whatever our farmer had, it was clearly not that. The local neurologist sought opinions from several experts in neuropathy over the years, but nobody was able to help. Our enduring farmer continued to be periodically tested and prodded with blood tests and nerve conduction studies over the years. The fluctuating nature of his face and eye symptoms prompted his local neurologist to check for myasthenia gravis (an autoimmune disorder that results from circulating antibodies against the acetylcholine receptors in the junctions where nerves stimulate muscles). All the blood tests came back negative. Interestingly, however, he did manage to diagnose another condition called Waldenstrom's macroglobulinemia (a type of lymphoma, or cancer of immune system B cells, characterized by excessive immunoglobulin M production resulting in bleeding and anemia). This was treated with rituximab (a monoclonal antibody that destroys B cells). The local neurologist decided to seek one last opinion. Which brings us to 2012, the date of this case. It had required nearly an hour for me to elucidate this history, a history that spanned four decades. It was time for an examination of our farmer. I shall be concise in relaying my findings here. First, he had a pronounced bilateral ptosis (drooping of both eyelids). The right eye was more affected. Second, there was a severe external ophthalmoplegia (an inability to move the eyes) - our farmer could not move his eyes in any direction. Third, his tongue was wasted (severely reduced in muscle mass) with fasciculations (involuntary quivering movements that usually result from nerve damage). Fourth, his limb muscles were all moderately wasted with reduced power, and he had markedly reduced vibration and proprioception in his hands and feet (the knees and elbows seemed unaffected). As a result of his sensory ataxia and weakness, our farmer could not currently walk, and I did not force the issue. Pondering, I came up with a list of four or five differential diagnoses. They each had their merits, but I did not really feel as though I had nailed this one. An old Zen proverb came to mind: "In the beginner's mind there are many possibilities, but in the expert's mind there are few" . While I was not exactly a beginner, I was far from being an expert, and I returned to seek the wisdom of our senior neurophysiologists. They listened sagely to my recantation of the story of our farmer, as well as to my list of differential diagnoses. The concluding statement was short, and one of them simply stated "I think I know what this is - never seen one, but heard about it in a conference once - but we should repeat the blood tests and nerve conduction studies just to be sure". The voltage changes created by electrical signals being relayed down a nerve appear as waves. 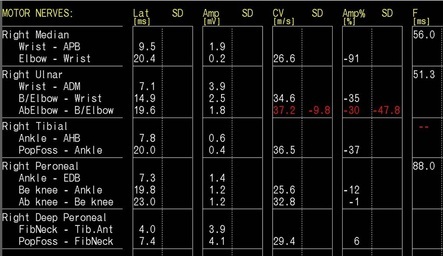 This table shows the wave latencies (Lat), amplitudes (Amp), and conduction velocities (CV) for several sensory nerves. They are all completely absent. This is highly abnormal and suggests that the sensory nerves are severely damaged. Here are the peak latencies (Lat, measured in ms), amplitudes (Amp, measured in mV), and conduction velocities (CV, measured in m/s) for some motor nerves demonstrating prolonged latencies, reduced amplitudes, and reduced conduction velocities in all nerves. The prolonged latencies and reduced conduction velocities are consistent with demyelination (conduction velocities less than 75% of the lower limit of normal). The reduced amplitudes are consistent with axonal loss. Waveform from the right arm median motor nerve. The top green line is the signal at the wrist - it has an amplitude of 1.9 mV. The bottom red line is the same nerve measured at the elbow - it only has an amplitude of 0.2 mV. This is conduction block (a reduction of proximal nerve amplitude by at least 50% compared to distal amplitude), seen in demyelination. This is a waveform from the right leg tibial nerve. The top green line is the signal measured at the ankle and the bottom red line is the signal measured behind the knee - in each, there should be only one waveform, but here there are several smaller waveforms "spread out" one after another, indicating that the individual axons within the nerve are all conducting at different velocities. This is temporal dispersion, seen in demyelination. Right leg peroneal nerve F-waves (when a motor nerve is stimulated, an electrical signal is sent in two directions - one conducts distally to the muscle, the other one proximally towards a cell near the spinal cord called the anterior horn cell, resulting in "backfiring" and a recordable F-wave). 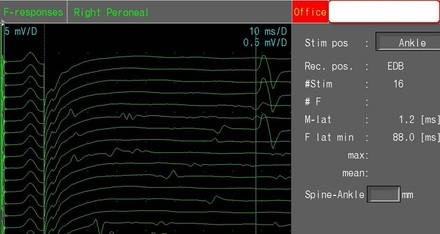 These F-waves have a latency of 88 ms (in the peroneal nerve, normal should be <58 ms). This is prolonged, indicating severe damage to not only the distal segments of the nerve, but the proximal segments as well. The repeated nerve conduction studies confirmed the mixed demyelinating and axonal neuropathy that had been noted so many years before, and all of our additional blood tests for alternative diagnoses came back negative. The only abnormality was found on immunoelectrophoresis (a somewhat laborious method for separating and characterizing proteins) which demonstrated the previously documented excessive amounts of immunoglobulin M (IgM) protein, an antibody produced by certain B cells of the immune system. The diagnostic saga was at an end - our enduring farmer had chronic ataxic neuropathy with ophthalmoplegia, IgM paraprotein, cold agglutinins, and disialosyl antibodies (CANOMAD) syndrome. (1) Clinically, a progressive sensory ataxia combined with relapsing and remitting cranial nerve symptoms. (2) Serologically, a detectable immunoglobulin M paraprotein as well as at least one detectable anti-ganglioside antibody. (3) Neurophysiologically, absent or reduced sensory responses combined with mixed demyelinating and axonal motor responses. It is rare; the largest study involves only 18 patients (Willison et al, 2001). CANOMAD syndrome is an autoimmune disorder in which abnormal B cells of the immune system produce IgM antibodies that attack the myelin of the peripheral nerves. An autopsy study performed on our farmer showed that B cells accumulate within the dorsal root ganglia (collections of neurons running up and down alongside the spinal cord involved in vibration and proprioception) as well as the cranial nerves (nerves that emerge from the brain and control the face and neck). The only treatments useful in CANOMAD syndrome are intravenous immunoglobulin (made from the pooled antibodies of blood donors, this somehow reduces the levels of harmful antibodies) and plasmapheresis (where blood plasma is removed from the patient, treated to get rid of harmful antibodies, and then returned). Usually, only a partial response is noted. Each spinal nerve has both dorsal and ventral nerve roots. In CANOMAD syndrome the B cells accumulate primarily in the dorsal root ganglia, collections of neurons running up and down alongside the spinal cord involved in vibration and proprioception. Myelinating Schwann cells of the dorsal root ganglia and cranial nerves are attacked by the IgM and anti-ganglioside antibodies in CANOMAD syndrome, producing the subsequent sensory ataxia and fluctuating cranial nerve symptoms (McKelvie et al, 2013). After diagnosing him following 40 years of uncertainty, we discussed what we had found with our farmer and sent him on his way back to rural Victoria. There was no change in management; he had already been receiving intravenous immunoglobulin for many years, and by pinning down the diagnosis we simply confirmed that he was on the correct treatment. Still, I believe that our farmer derived no small degree of satisfaction from finally knowing exactly what had been plaguing him all those years, and he gratefully accepted some information on CANOMAD syndrome that we were able to provide. Sadly, only three weeks later we received a phone call from his local neurologist - our enduring farmer had passed away, succumbing to a lung infection in his weakened state. I like to believe that he died a little more peacefully with the knowledge of the true identity of his life-long companion. McKelvie et al. 2013. Canomad: report of a case with a 40-year history and autopsy. Is this a sensory ganglionopathy with neuromuscular junction blockade? Muscle and Nerve 48(4), 599-603. Willison et al. 2001. The clinical and laboratory features of chronic ataxic sensory neuropathy with anti-disialosyl IgM antibodies. Brain 124(10), 1968-1977.